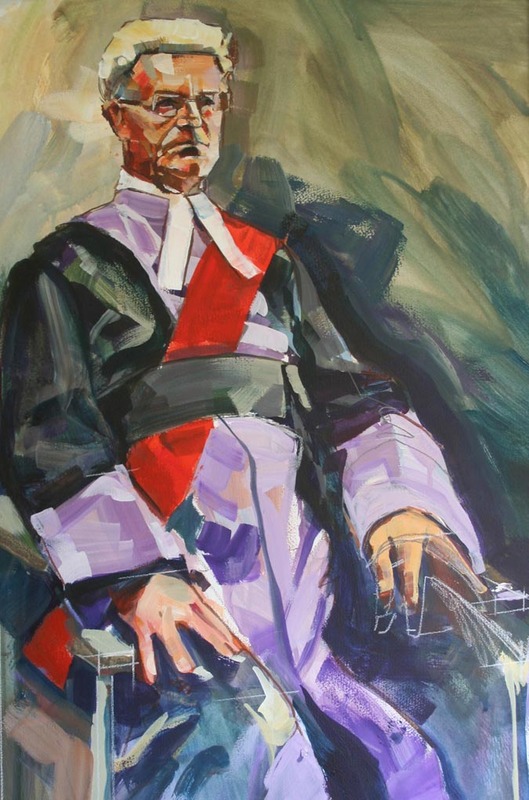 Last week at our portrait group we were lucky enough to have The Rt Hon Judge Chris Tyrer come and sit for us in full regalia! I managed to miss the previous week by being in France visiting our daughter and was really disappointed. However I was delighted to hear, on my return, that Chris was willing to come back for a second sitting and I am even more delighted that he will be coming back next week for a third time! I think three hours is no where near enough to develop a portrait to a finished state (whatever that is!) 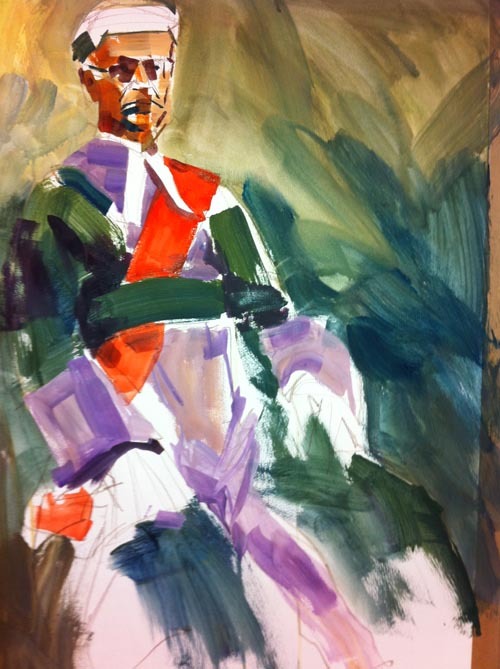 so I am keen to prove to myself that I can take a painting further without destroying the loose, exciting and fresh feel of the initial sitting. I don’t get this opportunity very often as our subjects are usually relieved to get away with the experience only once in a while. Above is the initial lay-in after the first hour! Below is the painting after the first sitting last Friday with some corrections indicated in white on the positioning of the hands and the perspective of the chair which I noticed looked a bit iffy when I got home and needs to be looked at next week. For anyone who might be interested in the technical aspect, I have used acrylic paints on 30×22 inch stretched Bockingford watercolour paper. I was not terribly happy with the composition but have since decided that I will mask off some space on the right side, telling myself that it will make the judge look more imposing and authoritative in a tall narrow frame (see below)!!!??? What do you think – you can judge for yourself! Now take a look at the finished painting HERE! I love it Al – he already looks very imperious and I actually quite like the composition! Thanks Nick – I need all the encouragement I can Get!